AMERICAN NEWS SERVICE: What Happens When a Man Wears Something Worth a Million Dollars in the Ghetto? What Happens When a Man Wears Something Worth a Million Dollars in the Ghetto? There are things which can easily be known simply based upon chain reactions. I used to mix baking soda and vinegar as a child to watch the reaction. It doesn't take too long before there is an explosion when the two ingredients are mixed in a bottle and the cap is screwed on. Walk through the hood with a million dollar medallion and see how long you survive. Now picture walking through the ghetto with five hundred times that around your neck and you come to understand what Suge Knight was doing back in 1996. There were many forces beyond his control at work. Saying this was about money doesn't really paint the picture. Money is a down payment on a house or what we use to pay the rent. This was about millions and millions of dollars - about living on eazy-street for generations. This was about life altering amounts of cash and everybody wanted Suge Knight dead so the looting of Death Row Records could begin and that looting is still going on today. Chaos Merchants takes us through the evidence that Death Row Records was in play and that Tupac and Suge Knight were both greenlit for murder on the night of September 7, 1996. 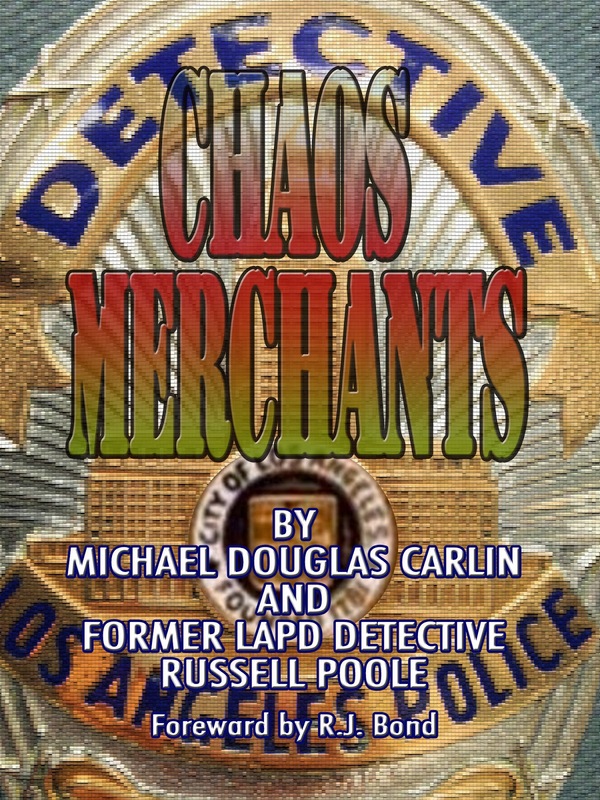 Chaos Merchants was what Russell Poole was working on when he passed away on August 19th 2015 pitching the Sheriff's Department on solving the two biggest mysteries in the history of music. Russell was in effect apologizing to Suge Knight for all of those years he shouted from the rooftops that Suge Knight was behind the murder of Tupac Shakur. Think about the change that Russell made in his viewpoint. He believed for nearly 20 years that Suge Knight was behind Tupac's murder because so much of the evidence pointed toward Death Row Records. When the evidence started pointing toward Suge as a victim that night and the people implicated were those around Suge it all began to make sense. The recent allegations that Sean Puffy Combs was behind Tupac's murder were fully debunked in Tupac:187. The gaping holes were exposed. That book was the catalyst that lead to additional clues coming in that painted the clear picture of what happened that night. Russell and I were assembling those clues to present to investigators and what resulted from our investigation became "Chaos Merchants." Looking at the MGM footage yielded clues that the entire Orlando Anderson incident had been staged to set up a motive for what would happen a few hours later. The clues have been here all this time. Russell was going to meet with Sheriff's knowing that an off-duty Compton Cop was supervising the Orlando Anderson incident. That same cop was absorbed into the Sheriff's Department when Compton Police were disbanded. Russell was also going to talk about an off-duty Sheriff letting shooters into the 1Oak Nightclub the night Suge Knight was shot six times on August 24th, 2014. That same Sheriff was caught on video dropping the shooters off at the airport the next day. Russell was going into the den of the lion to ask Sheriff's to do the right thing. We did not know at the time that the Sheriff supervising the Orlando Anderson incident had only retired in 2014 from the Sheriff's a month before Suge was shot at 1Oak. We did not know that the LAPD cop caught hiding evidence in his desk drawer during the first Wallace Civil Trial was now the Captain of Homicide at the Sheriff's. That trial was ruled a mistrial when thousands of pages of information implicating Rampart Scandal officers in the murder of rapper Christopher Wallace were found hidden in the desk drawer and kept from the plaintiffs in the case. We also did not know that four of the investigators in the Suge Knight cases were waiting to meet with Russell instead of the lone promised homicide investigator who feigned interest in reopening the cases. Russell was walking into a very explosive situation. Russell Poole three days before his death. He had a spring in his step as I spoke to him that morning. He was meeting with investigators to solve the two cases that haunted him every day for nearly 20 years. He was hiking six miles a day and was confident that he was armed with the truth. Years before, Russell was fearful that LAPD was gutting the murder books in the cases and he made photocopies of all of the case files before he left the department. He was moved off of the investigation and his fears were confirmed as the files were all purged to derail any future investigation. Russell preserved history by making photocopies. The book Labyrinth by Randall Sullivan is about Russell Poole and the Rampart Scandal. Reggie Wright Sr. from the movie Biggie and Tupac. By the time the movie was shot Reggie Wright Sr. was a Los Angeles County Sheriff. He retired from the department in 2014 just a month before Suge Knight was shot six times in the 1Oak Nightclub. That venue was chosen because Sheriff's would respond and that response could be controlled by those close to Wright Sr. The altercation at Tam's in Compton was also responded to by LA County Sheriff's and the same investigator who handled the shooting at 1Oak also handled the Tam's investigation. Russell was convinced this was a conflict of interest. Reggie Wright Sr. captured on the MGM Surveillance tape the night Tupac Shakur and Suge Knight were shot in Las Vegas. It was necessary to ensure that Orlando Anderson was not detained for too long or they could not pin the murder of Tupac and Suge on him... at least that was the plan. The hit was a complete failure. Tupac looked like he would survive and Suge was only grazed. They would use the exact same tactics on the Biggie Smalls hit with an experience modification of a professional shooter and armor piercing ammunition. In effect they learned from their mistakes. This is a rare photo of Reggie Wright Jr. back at the height of Death Row Records. He was Suge Knight's personal bodyguard and the head of Death Row Security. He disarmed all of the bodyguards that night and was in control of where everybody would be and controlled all assignments including many off-duty Las Vegas Police working security that night. Death Row Records had learned that compromising investigations by hiring off-duty cops was a lethal way bury the truth. It worked at the El Rey beating of Kelley Jamerson and it worked in the beating of Mark Anthony Bell. Bodyguard Michael Moore was standing next to Reggie Wright Jr. at the time of the shooting of Tupac and Suge. Moore heard "got-em" come over Wright's radio. With 13 bullets fired it really looked like they "got-em!!!" Reggie Wright Jr. leads Orlando Anderson away the night Tupac and Suge were shot in Las Vegas. Russell Poole was going to Sheriff's with all of the above photos as well as the information that an off-duty Sheriff was involved in the plot to kill Suge Knight on August 24th 2014. The photos were highly troublesome for Sheriff's who had just weathered a storm that led to 20 indictments. Russell was pitching the Sheriff's on solving the murders of Tupac and Biggie that he felt could be solved. Russell died in that meeting. Less than two hours after Russell's death Reggie Wright Jr. released a YouTube video gloating about Russell's death and threatening RJ Bond's life and any others that would investigate him. Reggie Wright Jr. revealed that he knew all of the intimate details of the meeting investigators had with Russell. He knew for weeks that the meeting would happen. In fact, the meeting had been scheduled for three weeks prior to the meeting occurring. How does a suspect in two murders know the details of a meeting with Sheriff's investigators to reopen those specific murder cases? 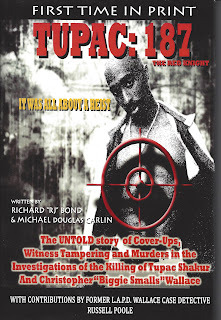 Tupac:187 debunks the myth that Sean Puffy Combs had anything to do with the murder of Tupac Shakur. That myth first surfaced as a rumor planted by Death Row Records management while Suge Knight was behind bars. It was meant to send investigators down the wrong path. 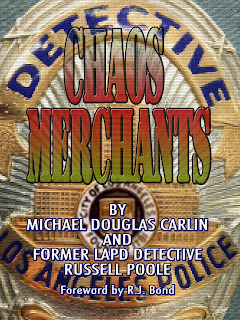 Chaos Merchants is the book Russell Poole and Michael Carlin were collaborating on at the time of Russell's death. The first section of the book was what Russell took to the meeting with the LA County Sheriff's investigators the day he died. The day before Russell's meeting the Sheriff Investigator called to talk about what they would be meeting about and confirmed to Russell that an off-duty Sheriff had let the shooters into the 1Oak Nightclub the night Suge Knight was shot six times on August 24th 2014. Russell insisted that each fact be documented with the source. There are over 300 footnotes in the book and many of those lead to a link of the source. What happens when you mix baking soda and vinegar in a closed container? Find out in Chaos Merchants and Tupac:187. 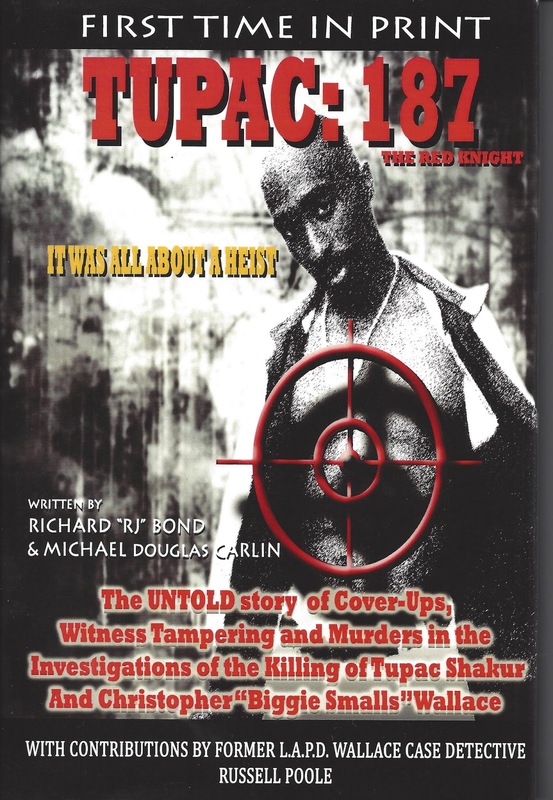 Find out why Russell Poole believed the murders of Tupac Shakur and Biggie Smalls could be solved. Thank you Michael for believing in Russ and listening to what he had to say. He was passionate about his work. You can't tell a seasoned detective to stop investigating a case he knows in his soul that can be solved. No one else would do it with that kind of passion. Others have made statements and even written books stating that Russ' got it wrong. Really?? What facts and footnotes do they have? You, RJ and Russ never gave up or gave in. The Poole family is very proud of Russ and have been behind him 100%. Yes it took a lot of time away from our family but hard work gets you to your goal.So does the truth! !